Let your oven do the work so you don’t have to. So good, so tender and great to share with company. Preheat your oven to 350 degrees. 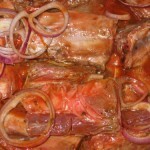 Place the ribs in a heavy Dutch oven or pot with an oven proof lid. Sprinkle on the salt, pepper and mustard. Then place everything else in and around meat. Cover and bake for 3 hours. Check occasionally to see if it’s drying out and you should add about 1/2 cup water – it makes its own juices, so you normally do not have to add this extra water. Oh how I love the big slow cooker my daughter gave me for Christmas! Never having one before, I have to say that learning to use it was a snap. Life just got so much easier to make a big batch of frozen, pre-cooked meatballs. 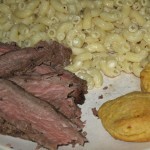 These will be great for a Superbowl party or as we had them, with some buttered egg noodles and steamed broccoli. You will make these again & again, I promise. Recipe is based on a 5qt. or larger machine. In a medium bowl, combine everything up to the meatballs. Put the meatballs in the cooker, pour the sauce over and gently mix to coat as best you can. Cover and coover on low for 4 1/2 hours our until heated through. Mix thoroughly before serving. 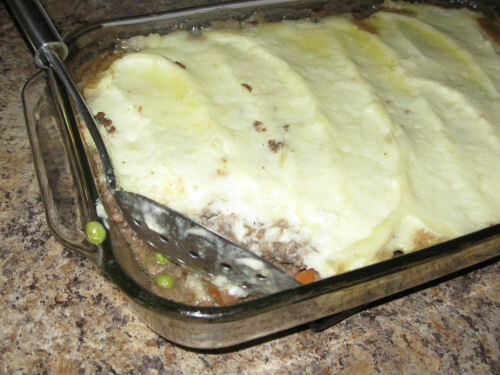 Shepherd’s Pie seems to be from both English and Irish and eaten around St. Patrick’s Day. I don’t care what time of year it is, this is a perfect dish to make on a bleary, rainy day. But don’t let that stop you, we have 15 inches of snow where I live, and it’s delicious then, too! 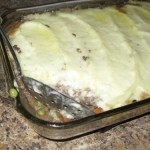 In a large pot melt the butter then add the ground beef, onion, and carrots and cook over low heat until the meat is browned – takes about 10 minutes; drain and place back in pot. Add the flour and cook for one full minute, then add the beef stock, Worcestershire, spices and peas. Increase heat and bring to a boil. Reduce the heat to low and simmer, covered for about 30 minutes or until thickened, stirring often. Remove from heat and set aside. Meanwhile, place the potatoes in a pot with enough cold water to cover, sprinkle in some salt and bring to a boil. Lower heat to a simmer and simmer for about 25 minutes. Drain and place potatoes in a bowl with 6 Tbsp. butter, the half-n-half and salt & pepper to taste – mash until smooth. I use a hand held mixer to mash them. 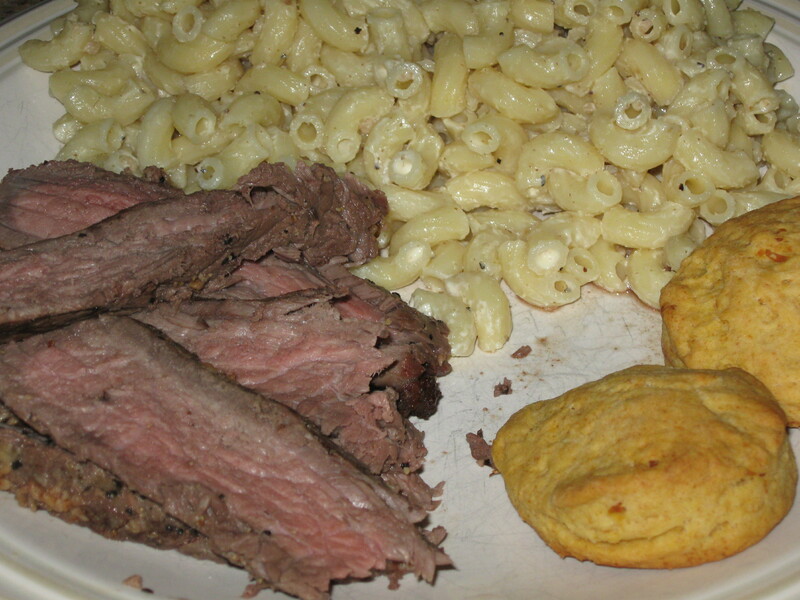 Preheat your oven to 375 degrees and transfer the beef mixture to a 9 x 13 pan. Place the mashed potatoes over the top of the beef mixture and spread around as carefully as you can – take your time spreading them. Dice the last 2 Tbsp. butter and scatter over the top. Bake this until bubbly and slightly browned – about 30 minutes. So tender and flavorful. This requires about three to four hours in the oven. Serve as an absolutely fabulous Sunday dinner with friends or family. Potatoes on the side is a good match. Please try this recipe, you will love it! Preheat your oven to 350 degrees and get out a large ovenproof pot that you have a lid for, or you can use aluminum foil to cover pot. Rinse and pat dry the brisket. Sprinkle the black pepper all over it and rub it in, then set aside while you continue. Heat the oil in the large pot, place the brisket in and brown well on all four sides for about 8 minutes on each side. Take out the brisket, set aside, add everything up to the garlic and cook for 10 minutes. Turn off the heat, add the cranberries or broth, stir well then place the brisket on top of the mixture. Cover with a lid or aluminum foil, place in the preheated oven for 2 hours and 30 minutes. Take the pot out of the oven but don’t turn off the oven. Scrape off the sauce from the brisket into pot and place brisket onto a cutting board to rest for 10 minutes. Cut it into diagonal slices against the grain and gather the slices back together to return them to the pot. Completely cover the meat with the sauce and season with about a tsp. of kosher salt. Return the pot, uncovered, to the oven and bake for 2 more hours, basting every 30 minutes. Serve hot with the sauce on top or alongside. A delicious alternative to beef. Grill them outdoors, broil them in a conventional oven, or pan-fry. Use your imagination and enjoy them! Optionally add a dash or two of hot sauce, or cayenne pepper, or you can add almost any of the McCormick’s seasonings – they’ve got lots of them to choose from. Fresh tomato slices, herbed mayo, relish, etc., – whatever fixin’s you want, we like a nice slice of fresh goat cheese or mozzarella cheese. Over med-high heat, melt the butter and oil. 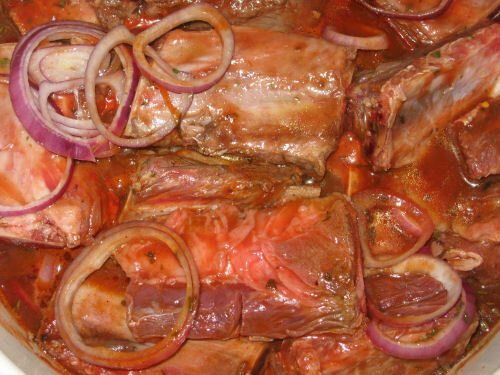 Add the onion and cook about 10 minutes – until tender. Remove the pan from the heat and put it into a large bowl; let it cool off about 15 minutes before you use your hands to mix everything. When it’s cooled down, add all the remaining ingredients up to the buns and mix well, but gently, with your hands. Divide into about 6 patties and grill till done. 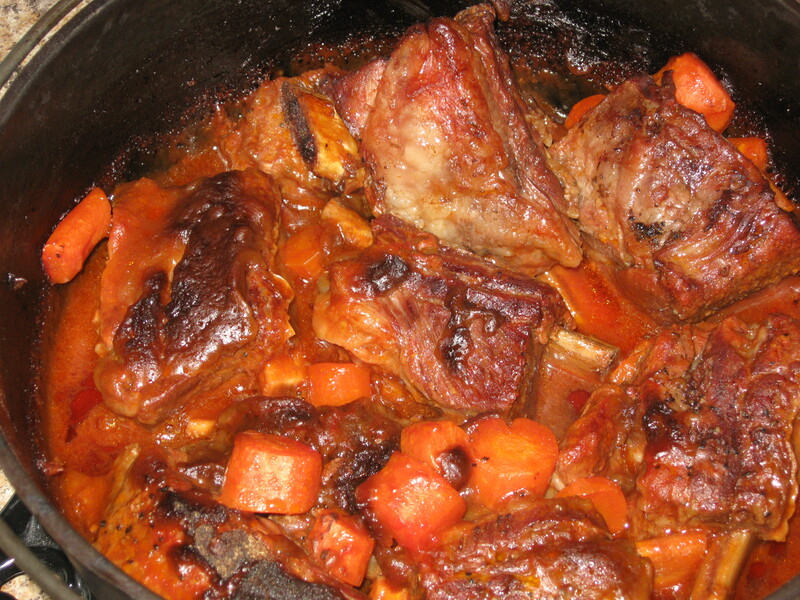 Use either stewing beef or beef ribs – either way you go it will turn out divine. Possible side dish would be some buttered egg noodles, or rice, or even mashed potatoes. 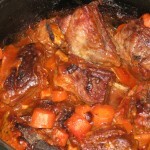 In a large pan or dutch oven, mix together the sauce and lemonade – heat till hot, then stir in all ingredients except beef. Mix well, add beef, bring to a boil, reduce to a simmer then cover and simmer for 3 full hours. Stir occasionally.